Flight Centre boosts ground transport offering for Corporate clients with MYCAB and Amadeus. 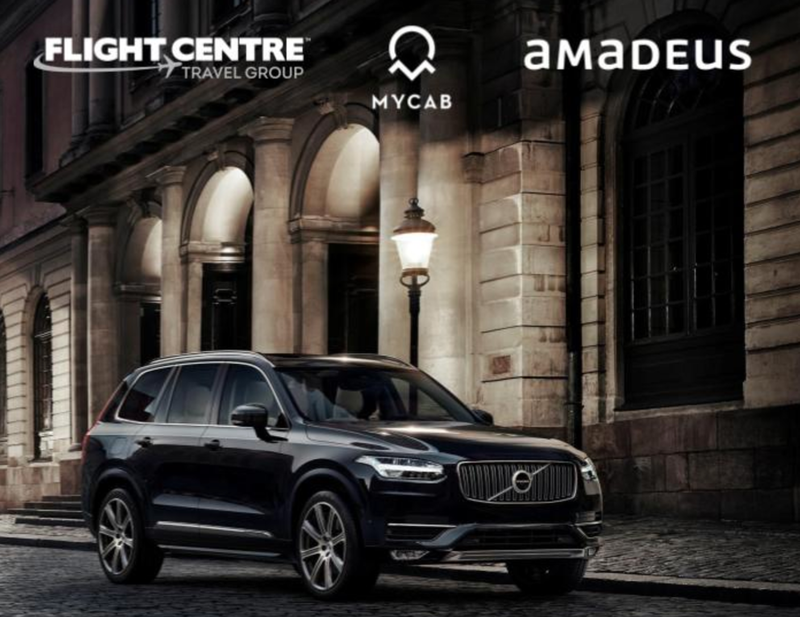 MYCAB is delighted to announce the launch of a new EMEA wide transfers offering and partnership with Flight Centre Travel Group and Amadeus. Starting in the UK with FCM Travel and Corporate Traveller – consultants are able to seamlessly book ground transfers via Amadeus. Traveller details and dates are automatically extracted from an existing flight booking and search fields are pre-populated in the Amadeus booking tool. The booking is fully integrated into the PNR, which allows for simplified trip servicing and easy access to a transfer booking when needed. The integrated MYCAB and Amadeus’ solution is also fully enabled with FCM and Corporate Traveller’s powerful new SEEQA online booking tool. This means that for the first time travellers and bookers can arrange point-to-point transfers and chauffeur services at over 300 airports and cities in 75 countries using an online booking tool. Launched earlier this year, SEEQA is a bespoke solution built on of the Amadeus cytric Travel & Expense tool that allows Flight Centre Travel Group to add proprietary functionality and content. The MYCAB offering includes real-time flight tracking and adjustment of pick-up times based on flight arrival times. All vehicles are properly licensed, registered and insured and travellers are greeted personally by smartly dressed chauffeurs on arrival. Driver and passenger can make contact via SMS prior to pick up and in transit to ensure a seamless traveller experience and support employers’ duty of care obligations. Additional dedicated phone and email support is also available to passengers and bookers. Nigel Clarke, CEO MYCAB International added: “It’s a delight to be working with Flight Centre’s corporate businesses as this is a great fit to the MYCAB model and capabilities in offering a world-class and seamless experience for travellers, organisations and travel management companies. MYCAB is unique in providing a global transfers offering with full accountability from booking to fulfilment, payment, billing and administration, while also being rapid to deploy and customise through Amadeus technology”. After starting with one leisure travel shop in the early 1980s, Flight Centre Travel Group (FCTG) has enjoyed remarkable growth to become one of the world’s largest travel groups with an annual turnover of AUD 20 billion. Headquartered in Brisbane FCGT operates some 40 brands globally, has 2800 businesses and employs over 19,000 people worldwide. Flight Centre has company-owned operations in 23 countries and a corporate travel management network, including business travel brands FCM Travel Solutions and Corporate Traveller, that spans more than 90 countries. FCTG was listed on the Australian Securities Exchange in 1995 (ASX: FLT).